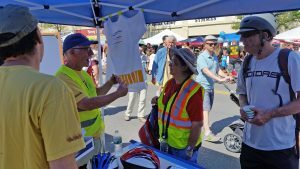 “Town Day is always a highlight of the year for us and it is great to be able to help people out with the helmets and vests,” Chairman Chris Tonkin wrote us. The committee also coordinated our donation of 170 helmets to the Arlington Public Schools last Spring. Our Project KidSafe bicycle helmets were donated to children who needed one during Walk to School Day events for elementary school students. In April, Breakstone, White & Gluck also made a donation to the iCan Shine Bike Camp. The camp meets during April school vacation and teaches individuals with disabilities age 8 and older how to ride a bicycle. We have partnered with the camp to make this donation for the past three years. 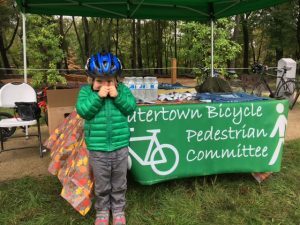 On September 24th, the Watertown Bicycle & Pedestrian Committee donated 100 helmets to children at the Watertown Faire on the Square. This was the third year we have partnered with the committee. We thank the committee members in both communities for taking time to fit the helmets and answer questions about safety. Breakstone, White & Gluck cares about the safety of cyclists in Massachusetts and actively supports cycling safety in the Boston area. We launched our Project KidSafe campaign in 2013 to protect children. 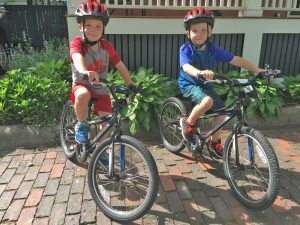 Our goal was to give children access to a safe bicycle helmet, which properly fits and help them understand the importance of wearing one every time they ride. Read more about our 2016 Project KidSafe campaign. Photos: Top, students in Arlington Public Schools receive new helmets during a Walk to School Day event. 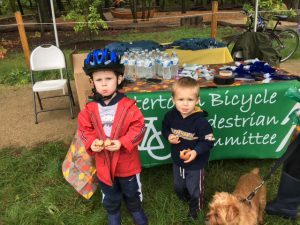 Middle, Chris Tonkin of the Arlington Bicycle Advisory Committee talks about bicycle safety at Arlington Town Day in 2016. Bottom, children at the Watertown Faire on the Square give a thumbs up for our Project KidSafe bicycle helmets.